The Risks of Lack of Wood Burning Stove Maintenance and Sweeping Once you own a wood burning stove you become responsible to ensure it works safely, burns cleanly and lasts a long time. 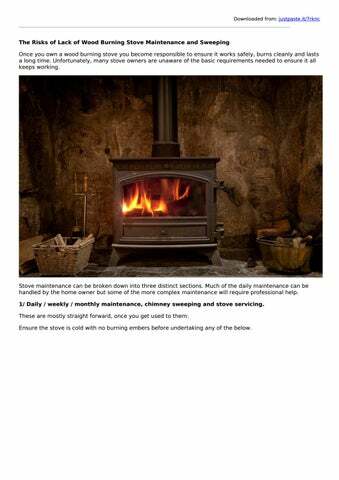 Unfortunately, many stove owners are unaware of the basic requirements needed to ensure it all keeps working. Stove maintenance can be broken down into three distinct sections. Much of the daily maintenance can be handled by the home owner but some of the more complex maintenance will require professional help. 1/ Daily / weekly / monthly maintenance, chimney sweeping and stove servicing. These are mostly straight forward, once you get used to them: Ensure the stove is cold with no burning embers before undertaking any of the below. 1. Clean out the ash on a regular basis. This may seem obvious but itâ&#x20AC;&#x2122;s often overlooked and the old adage of a little ash in the fire bed for burning wood is often abused. 2. Regularly check all controls for smooth movement. 3. Check firebricks for cracks monthly. 4. Burn only seasoned or kiln dried wood. Wood that is the correct size for the firebox.Burning wood that is low quality or high in water content will damage appliance and liner, may cause a chimney fire and is very bad for the air we breath. 5. On a monthly basis, the baffle plate should be removed and the flue way checked for soot build-up and potential blockage. If thereâ&#x20AC;&#x2122;s either, do not delay calling a professional chimney sweep is the next thing.If you are not confident with removing and replacing the baffle, contact a professional to teach you how or even do it for you. 6. Clean the glass. If you cannot see the flames then you do not know how well your fire is burning. Remember moderate flaming combustion is the gold standard. 7. The last part of personal maintenance is planning regular expert maintenance from a registered industry professional. 2/ Chimney sweeping The sweeping of the chimney is imperative to the correct and safe functioning of the appliance. In our opinion Chimneys should only be swept by registered professionals. Chimney Sweeping is a profession that requires a great deal of knowledge, equipment and chimney sweep trainingat regular intervals. It is widely accepted that all chimneys should be swept annually as a minimum. Some chimneys require sweeping twice per year some even more frequently depending on use, safety factors and soot build up. A professional chimney sweep will also provide important advice, and confirm with you the required sweeping frequency for your usage, which will be backed up on an official sweeping certificate. Further to cleaning the flue the Sweep must smoke test the flue/appliance to ensure the safe release of flue gasses to the outside air, thus protecting the user from potential risks from or property damage. decay, wear and occasionally break. Repeated opening and closing of doors degrades rope seals which will eventually require replacing. Door Glass can be broken but more often becomes scratched or milky with use, replacing glass is not as straightforward as replacing the glass of a house window. The glass used in stoves is often a clear pyro ceramic which is held in place with heat proof fixings and sealed with a specially sized fibre glass rope. It is specially treated and pre-cut with bevelled or smooth edges to prevent early failure. Controls and hinges can become lose or siege with time. Castings can even crack. The best person to use for solid fuel servicing is a professional chimney sweep certified by any Chimney sweep associationor Hetas registered installer who is also trained and experienced in service and maintenance. The HETAS H009 is the de facto qualification in the U.K. for this type of work although those who hold the H003 will also in many instances be competent to undertake this work. Experience is very important when servicing is involved as there are so many appliances only time and practice can teach. Many users find it most beneficial to find a professional sweep who also undertakes servicing. This can save time and money.